I use only one pencil grade, a 4B. A 4B is pretty dark out of about twenty pencil grades from 9H being the lightest (hardest lead) to 9B being the darkest. Many of these different grades are often used in one drawing by other artists to get a wide range of values from light to dark. But I use just one grade and I still get a wide range of values. How? Pressure. The lighter I press, the lighter the value. The harder, the darker. And pressure comes directly from my grip! For each of these grips my hand is resting on the paper. 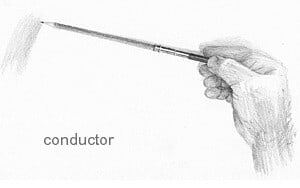 The Conductor This grip is light, pencil-flat and far from the point . . . the farther back from the point the better which is why I use a pencil extender. 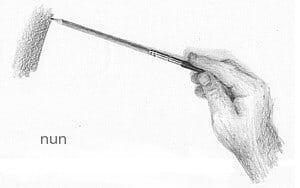 This grip lets the pencil only lightly touch the paper like a conductor's baton skirts the air. 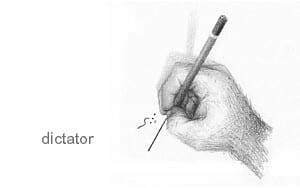 I use this grip to make LIGHT strokes which can be WIDE when the point is sharp and the lead lays flat on the paper. The Nun This grip is like "the Conductor" but with a fore finger on top. Now I have the same reach and the same angle but with a little more downward force like a school nun requires to rap your knuckles with a ruler (in the old days). I use this grip to make DARK strokes which can be WIDE when the point is sharp and the lead lays flat on the paper. The Dictator This grip is tight, pencil-upright and close to the point like the second-grade teacher who clenched her teeth and slapped her hand on my desk trying to teach me penmanship! I use this grip to make lines that are the DARKEST, the PRECISEST and the FINEST when the point is sharp. The Dude The most common and versatile this grip is relaxed, pencil-tilted-back and halfway to the point like a surfer who lives the summer life on one hand but works hard in the water on the other. 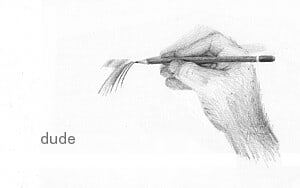 I use this grip to make lines that are LIGHT or DARK, BRIEF or FLOWING, LOOSE or PRECISE.